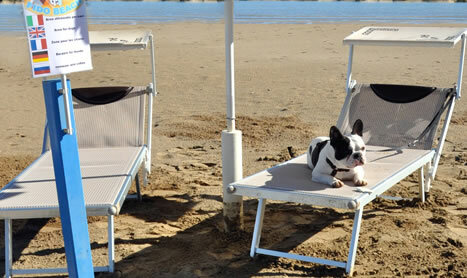 If you want an exclusive place in the sun, then choose the Bed & Breakfast & Beach option. 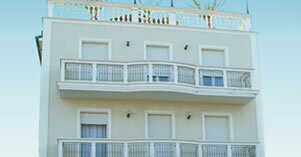 We will provide you with a beach umbrella and 2 sun beds per room (double) starting from the 3rd row free of charge. If you choose the PREMIUM option, you will be able to watch the sea and your children play while comfortably lying under your beach umbrella on the FIRST ROW just a few meters from the water. Bagno Giorgio bathing establishment, which is located right in front of Villa Paola, welcomes you to the beach and is here to offer you relaxing moments, which is why the sun beds are arranged so that everyone has the right amount of space to enjoy the beach while sitting under the shade of large beach umbrellas. All the sun beds have a comfortable cushion to combine a bit of rest to the pleasure of sun bathing. The wide beach offers children a large, safe protected area in which to play in. The entertainment staff provides a wide range of activities for both adults and children such as fitness, miniclub, sports competitions and activities, and theme parties. Wi-Fi is available to guests free of charge. Wellness Sailing – beauty and wellness treatments during a day cruise aboard a Turkish gulet. Daytime Wellness – yoga, shiatsu, pilates, reflexology, energetic awakening, oriental dance classes, meditation, workshops. Happy Children Beach – specially organized events for childrens’ wellness. Wellness by Night – tastings of organic products, theme dinners, nightlife events, moon dawn boat cruises during full moon nights. Dear friends, we have arrived at the beach. It may seem unbelievable, but here at Bagno Giorgio we are also very welcome! I love the sea and when I do not have any commitments at the hotel, I spend the whole day here at the beach where everyone loves me, feeds me and keeps me entertained. I also like to take long naps in this peaceful and safe beach. I can’t wait to meet you and make new friends. I’ll be waiting for you! There are well-equipped areas for us where we can eat, rest, make new friends and play. I hope you come and join us. We look forward to seeing you!